Kefir is a cultured, creamy product with various health attributes. Kefir's tart and refreshing flavour is similar to a drinking-style yogurt but it contains beneficial yeast as well as friendly probiotic bacteria. The naturally occurring bacteria and yeast in kefir combine to bestow health benefits when consumed regularly. Kefir is loaded with valuable vitamins and minerals and contains easily digestible complete proteins. For the lactose intolerant, kefir's abundance of beneficial yeast and bacteria provide lactase, an enzyme which consumes most of the lactose left after the culturing process. How is Kefir Usually Made? Kefir is usually made from any type of milk; cow, goat or sheep, coconut, rice or soy. Although it is slightly mucous forming, the mucous has a 'clean' quality that creates ideal conditions in the digestive tract for the growth of friendly bacteria. 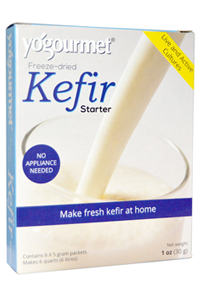 Kefir is made from gelatinous white or yellow particles called 'grains.' This makes kefir unique, as no other milk culture forms grains. These grains contain the bacteria / yeast mixture clumped together with casein (milk proteins) and complex sugars. They look like pieces of coral or small clumps of cauliflower and range in size from a grain of wheat to a hazelnut. The grains ferment the milk, incorporating their friendly organisms to create the cultured product. The grains are then removed with a strainer before consumption of the kefir and added to a new batch of milk. 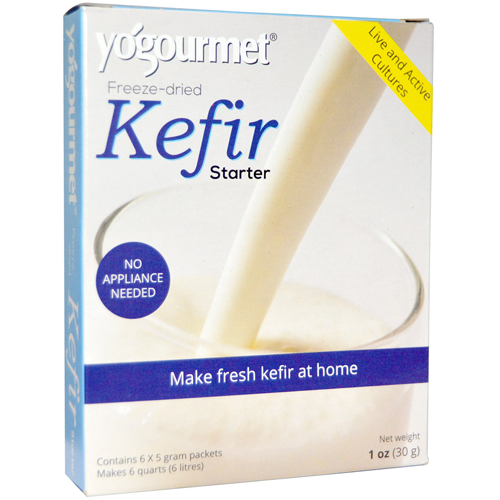 This Kefir Starter pack from Yogourmet makes 6 litres of nutritious, beneficial Kefir. Use 5g of starter per litre of milk. 1. Heat 1 litre of milk to 180°F (82°C) or bring to the boiling point. Cool to 73-77°F (23-25°C). 2. Dissolve 5g of starter in a small amount of the cooled milk in a cup. Pour back into the litre of milk and mix well. 3. Pour the inoculated milk into a clean container, then cover and let stand at room temperature until curd forms (approximately 24 hours). 4. Refrigerate about 8 hours to stop the process. 5. Stir to liquefy and enjoy. Always store kefir in the refrigerator.